How are you better at cleaning dirt off a mushroom than a simple kitchen sponge? (Are you really more advanced than a sponge that can also clean counter tops, dirty pans, and the crud off the front of my refrigerator? Are you superior to a sponge that can also be tossed into the dishwasher to be disinfected between uses?) Why do mushrooms deserve a special cleaning treatment, more so than potatoes, radishes, or other dirt-laden vegetables? 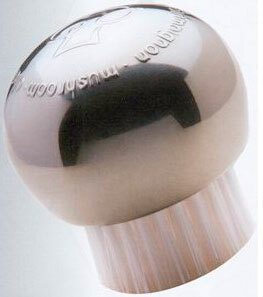 You baffle me completely, mushroom brush! Or wait, do I have it all wrong? Is this a brush to style a mushroom’s long, beautiful, locks of hair? Is the food in your cupboard safe to eat? Search StillTasty’s database to know what is safe and what should go. While there are many options to buy, sell, or donate items, this looks like a pretty good resource for tracking down some must have baby products. It also looks like a place to get rid of items that your little one has little to no use for. How to prepare for the worst. Reader question: Can convenience be a detriment to simple living? Reader Shalin wrote in this week and asked a question I hear often: Where is the line between convenience and simple living? Honestly, I don’t believe there is a set line between convenience and simple living. They aren’t on opposite sides of a scale. What is convenient and contributes to a simple life for one person may not have the same effect for someone else. Dish washing: I hate it with a passion. As a child, this was my chore, and I vowed as an adult never to live without an automatic dishwasher. To me, washing dishes by hand is a waste of time and steals valuable moments that I could be taking a walk with my family, playing a board game with them, or reading to my son. However, I have a friend who loves washing dishes. She enjoys having her family gather in the kitchen and everyone work together to clean up after a meal. Her family continues their conversation from dinner, each takes on a role in the chore, and washing dishes is as much a part of dinner as eating. To her, an automatic dishwasher detracts from a remarkable life. Neither of us is correct, and neither of us is wrong. We have made decisions about a dishwasher based on what is right for our families and for our pursuits of remarkable living. The automatic dishwasher helps me to pursue the life I desire, and washing dishes by hand helps my friend to pursue hers. What is important is that both of us have taken the time to evaluate the technology and weighed its advantages and disadvantages for our specific circumstances. Simply stated, either a product or service helps you to achieve the remarkable life you desire, or it doesn’t. Whenever you encounter a new technology or service, you need to learn about it and decide if it will help or hinder your life. Don’t worry if you’re breaking with traditions of the past or modern social norms — accept the technologies into your life that help you to focus more of your time on what matters most to you, and don’t accept those that distract from it. One of my second quarter resolutions for 2010 is to go rock climbing. Since I have never been rock climbing, I signed up for lessons and took my first course on Sunday. Up until my class began, I was under the impression that I would do a lot of climbing as part of my rock climbing class. I did make it up a small wall during the class, so there was some climbing. However, the majority of the class was dedicated to equipment, safety measures, and knot tying. In all honesty, the class should have been called Knot Tying 101. I was initially put off by the knot tying instruction. I went to rock climbing class wanting to rock climb. The next day, though, when my arms and fingers were sore just from going up the wall once, I quickly changed my opinion. It’s hard to learn a new skill as an adult. We have to trust someone else to show us the way. We have to train our minds and our bodies to behave in new ways. We have to practice. We have to not be good at something before we can get better. And, we can’t dive right in and do it exactly the way we have imagined it. Knot tying is vital in rock climbing. Improperly tied knots can mean the difference between a safe climb and serious, life-threatening injuries. Thankfully, most new skills that we acquire in our daily lives don’t start with life or death skills training. It won’t kill you if you fail to follow the instructions for how to use a new time tracking software program at work, but you may lose out on wages or waste time redoing your time sheets later. Learning the basics helps you to be more productive over the long term, and an initial investment in these fundamental skills can have huge rewards. If you need to go back and learn some basic skills to pump up your productivity (per the discussion in today’s first post), I recommend that you do it. Take the chance. Trust someone else to show you the way, and cut yourself some slack if you’re not great in the beginning. Once you master the new skill, you’ll save yourself significant amounts of time. I don’t watch the television show Celebrity Apprentice, but I recently saw an advertisement for it that stunned me. In the commercial, show contestant and former Illinois governor Rod Blagojevich is sitting at a computer attempting to type. I use the word “attempting” because it is obvious in the clip that Blagojevich has no idea where the keys are on the computer’s keyboard. A man who has held the highest elected office in his state cannot type (or at least couldn’t type at the time the video crews captured the scene). Forget his scandal, I cannot fathom how inefficient this one man made his state’s government simply because he can’t type. The hours he must have wasted just responding to e-mail! After watching this advertisement, and then again after reading the article “80 Ways to Steal Valuable Minutes for Your Work Day,” I have been thinking about basic skills that increase productivity — skills that are so obvious and fundamental to my behavior that I don’t typically think about doing them. In fact, they’re so obvious that I really had a difficult time composing a list. Improve the legibility of your handwriting. Read the manuals on the software programs you use regularly. Store items that are used most often in the most convenient places. When you’re finished using something, put it away. Learn and use people’s names. I know that I’m missing even more obvious productivity skills, so please add to this list in the comments. What are the most basic of basic things each of us can do to save time? I cannot tell you how excited I am to share this news with you. In April, thanks to the amazing generosity of the Fujitsu company, Unclutterer will be giving away FOUR ScanSnap S1300 scanners to our readers. April 22 this year marks the 40th anniversary of Earth Day, and we wanted to do something big to commemorate the event. We’ve teamed up with Fujitsu to help our readers cut back on paper waste, digitize clutter, and better organize work/home offices. We will give away one ScanSnap S1300 scanner on April 1, April 8, April 15, and April 22 (four scanners total) to celebrate. The prizes: The ScanSnap S1300 is the latest multi-page color scanner from Fujitsu. 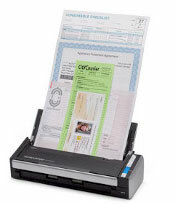 It is compatible with both PCs and Macs, scans both sides of the page, has optical character recognition, can transform any document into a Word file with just a click of a button, is able to scan a document up to 34 inches long and as small as 2″ x 2″, and is even Energy Star compliant. My description of this awesome machine doesn’t do it justice, so please check out the full product details. How to enter to win: Entering to win is simple. All you need to do is follow us on Twitter. If you aren’t already on Twitter, create an account and then follow us @Unclutterer. Each Thursday of the giveaway at 10:00 a.m. EDT, I will enter the number of our Twitter followers into the Random Integer Generator at random.org and select that day’s one winner. You only need to follow us once (and please, only once), to participate in the giveaway. If you already follow us on Twitter, then you are already participating and need not do anything more. Winners of the giveaway will have 24 hours to respond to a direct message from @Unclutterer to claim their new scanner. Failure to respond within 24 hours will disqualify you from the giveaway. While you’re following @Unclutterer, consider also following Fujitsu @ScanSnapIT for scanning tips and news. I know that some of you aren’t interested in social media and will complain about having to sign up for Twitter to participate in the giveaway — however, this is the easiest way for us to manage the giveaway and it insures that many of our readers are already entered to win with no additional effort on their part. Also, if you’re an avid Wired magazine reader, you know that social networking sites can help increase worker productivity if used efficiently. If you still wish to complain, well, please don’t because you can always cancel your account after the contest has ended. This is simply the easiest way for us to conduct the giveaway. I am so exited about this April event and cannot wait to give away FOUR Fujitsu ScanSnap S1300 scanners. Remember, you have until 10:00 a.m. EDT on Thursday, April 1, to follow us on Twitter for the first scanner giveaway. Good luck, and again a special thanks to Fujitsu for their amazing generosity! J.D. 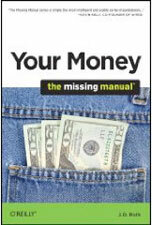 Roth, who writes the educational and extremely valuable personal finance blog GetRichSlowly.org, just published Your Money: The missing manual with O’Reilly books. The book is filled with charts, graphs, checklists, guides, and explanations that explore the basics and advanced methods of personal finance — all with Roth’s simple ease and charm. Roth’s financial philosophy is based on the premise that you have to spend less than you earn. Regular readers of this website know that this is also a fundamental rule of being an Unclutterer. If you spend more than you earn, your thoughts will consistently be focused on anxieties (clutter) about money instead of on what matters to you most. Roth details how to get out of debt, spend less than you earn, and save money for the future (saving also means that you alleviate worries about your financial future). I’m also fond of the section titled “The Tyranny of Stuff,” which is perfectly suited for Unclutterers. In short, Roth’s premise in this section is if you “own less stuff” you will spend less on new acquisitions as well as maintaining the stuff you choose to own — less clutter, less storage space, less to clean, and less wasted money on unnecessary purchases. In addition to the book, if you aren’t familiar with Roth’s blog GetRichSlowly.org, I also recommend you check it out. Money Magazine named it one of the top two financial advice sites on the internet. Roth knows very well how to get rid of cluttered finances. I give his new book two thumbs up. When two people live together and have different standards for cleanliness, frustration often ensues. A lotion bottle can easily become a charging station. If making a charging station (like we recommended earlier this morning) isn’t up your alley, then we know of a product that might interest you. The ceilings in the office pose a challenge that our workspace of the week winner handled with grace. The following are images I’ve collected over the years of two-person desks that I like. Is e-mail a flawed form of communication? Since words only communicate 7 percent of a message, is e-mail doomed to be a flawed form of communication? For his final installment of his data organization series, Brian extols his wisdom on external storage systems. “Work Smart: Do Your Worst Task First” by Gina Trapani for Fast Company. You can read the transcript or watch the video. Qik Announces iPhone Support. If you have an older model iPhone, you can now record video with it. No need to shuck out the money for an upgrade. Qik also works with most smart phones. The slideshow “New Kits for Container Gardens” in the New York Times introduces a handful of great ideas for small space gardening. If you don’t have a backyard and want to garden, be sure to check out the corresponding article on the same topic. “How to Get Back Into Your Routine After a Break” by Ali Hale for Dumb Little Man. I struggle with this every time I travel for business or take a vacation. “Organize with Handmade Bins” by Holly Becker. I really like these alternatives to traditional storage baskets. “Handmade: Transform a Bucket into a Wastebasket” on DIY Life is an inexpensive way to get a stylish trash can on the cheap. 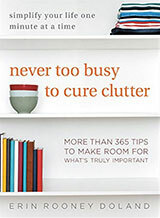 “Clear a Surface.” Gretchen Rubin talks about how outer order contributes to inner calm. “10 Ways to Deal With the Non-Simplifying Others in Your Life” on ZenHabits. A great reminder for anyone who shares a space. Were there any uncluttering articles this week that caught your attention? Share them with us in the comments. My husband and I are both not great at keeping clutter under control, but I am the worse of the two of us. I am especially guilty of magazine clutter. Why am I unable to throw away magazines? It’s seriously painful for me to get rid of them. The only plausible explanation I’ve come up with is that the magazine has done such a good job marketing themselves (all of them have, mind you) that it embodies a lifestyle and not just a pack of paper. By seeing that magazine, I feel like I’m living the lifestyle. I know it sounds silly, but I think this is the truth. Anyway, I don’t want to trash all my magazines, but I need to be able to part with a good chunk of them. Any advice for a magazine hoarder? I have this problem with Dwell and Atomic Ranch. I don’t know why, but recycling them is difficult for me — even knowing that the majority of their content is available for free online a couple weeks after the magazine hits newsstands. They definitely promote a lifestyle, as much as eye candy and design inspiration. My way to process magazines has actually changed a little bit in the past year, so I’ll walk you through the process. Also, be sure to check the comments to read how other people also work to keep their magazine clutter under control. When a magazine or catalog comes to the house, I write its arrival date in large print on the cover with a black Sharpie. If you plan to donate your magazines to a doctor’s office or nursing home after you read them, go ahead and mark out your name and address at this point, too. I then put the magazine or catalog straight into the magazine holder. If the previous month’s issue is still in the holder, I’ll immediately remove it from the holder and toss it into the recycling bin or donation pile. If I haven’t processed the issue in a month, I’m not going to get to it. Each morning when I get my cup of coffee, I’ll grab a magazine out of the holder to peruse while I sit and sip on my caffeinated miracle juice. Anything that I might want to read again or sparks my interest, I’ll crease down the top page corner. If you plan to donate your magazines or catalogs to a group instead of recycle them, you’ll want to use a flatbed scanner instead of a scanner that requires you to rip the pages out to feed through the machine. If you don’t have a scanner, you can wait until the content appears online (usually the first day of the month) and then create a bookmark of the article online and save it to a folder by type (work inspiration, home decor ideas). This is also a good idea if you have limited hard drive space. An add-on like Scrapbook for Firefox allows you to save annotated notes on the bookmarked web pages. No matter what method you use, you need to get in the habit of never having a magazine or catalog in your home that is more than a month old. It will be difficult in the beginning, but once you see that you can access the information again, your mild anxiety will likely fade. Thank you, Nia, for submitting your question for our Ask Unclutterer column. Good luck! This space could use a little cable management, but otherwise it is a really well-organized office. I particularly like how the two clipboards that (I assume) are used frequently are extremely accessible. The desk legs do double duty as filing cabinets, which is utilitarian and a nice design element. The other side of the office is where Inklore does her print making and sewing that she sells on Etsy (the pillow on the chair is one of hers). The side of the room we’ve featured here is where she does her order fulfillment and pencil pushing. 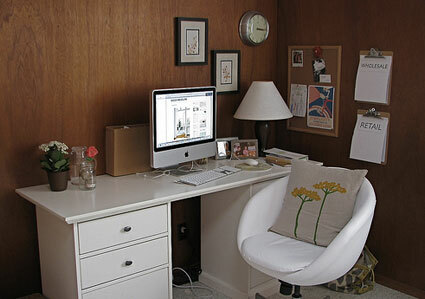 Two offices in one space makes a great deal of sense and definitely keeps things organized. Thank you, Inklore, for your submission to our Flickr pool. 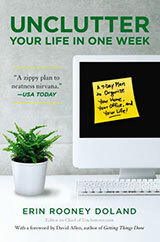 Glen Stansberry, productivity blogger and the brains behind the LifeRemix network (a network Unclutterer proudly belongs to), authored “80 Ways to Steal Valuable Minutes for Your Work Day” Tuesday for American Express’ OPEN Forum website. The article gives tips and insights from 19 small business and productivity writers and consultants on how to get more done without having to clone yourself. Improve your typing speed. Think about how much time you spend in email and other forms of online communication. Improving how fast you type could potentially add bunches of minutes to your day. You may not agree with all of the tips provided, but you’re sure to garner at least one or two gems from “80 Ways to Steal Valuable Minutes for Your Work Day.” Additionally, I liked the article because it introduced me to other articles, blogs, and writers on productivity.